On February 11, 1860, Vicente Lukban, was born in Labo, Camarines Norte to Agustin Lukban and Andrea Rilles. After his elementary education at the Escuela Pia Publica in his hometown, he proceeded to Manila and enrolled at the Ateneo de Manila and later, at the Colegio de San Juan de Letran. He was employed as official criminalista in the Court of the First Instance where he became acquainted with Marcelo H. del Pilar, Doroteo Jose and other patriots. Back in his hometown, he worked as Delegado Municipal and Juez de Paz. In 1894, he was inducted into the Masonic Lodge adopting the name "Luz del Oriente" (Light of the Orient) and co-founded Lodge Bicol in Camarines with Juan Miguel. In 1896, Lukban resigned from government service and engaged himself in business and agriculture. He founded the agricultural society La Cooperativa Popular. On September 29, 1896 Lukban was in Manila attending a meeting of the agricultural society when Spanish authorities arrested him for his "alleged" involvement with the Katipunan. He was tortured and incarcerated in the Bilibid prison and was only released on May 17, 1897 after the Governor-General granted amnesty to political prisoners. Lukban joined the forces of General Emilio Aguinaldo and was given responsibility in putting up fortifications and gathering provisions for the revolutionists. Having earned the confidence of the General, Lukban became one of the close circles of revolutionary leaders. He was one of the signers of the Pact of Biak na Bato in December 1897 and was among the Filipino leaders who went on exile to Hong Kong. In 1898, Lukban returned to the Philippines and resumed his involvement with the revolutionists, this time with the rank of a Colonel. 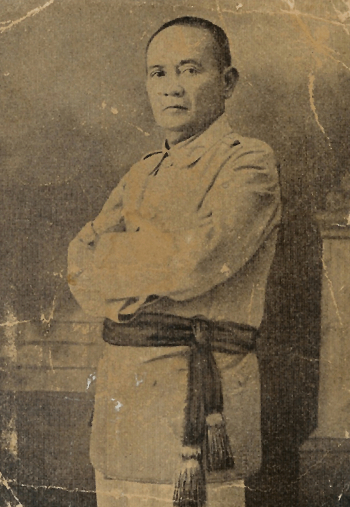 On October 29, 1898, General Aguinaldo appointed him Comandante Militar of the Bicol region and through which capacity he organized the local militia, settled political disputes and collected war contributions for the revolutionary government. On December 21 of the same year, he was promoted General of Samar and Leyte. There he circulated proclamation Compoblanos Samareños y Leyteños in January 1899 aimed at uniting the inhabitants to achieve the common good and subsequently took over the command in Leyte. When the Filipino-American War broke out the in February 1899, Lukban rallied the residents of Samar to fight for freedom. Knowing the futility of fighting against a well-armed enemy, he established his arsenal in the mountains of Catbalogan and carried out guerrilla warfare, the most glorious of which were in Catbalogan, Catubig and Catarman. Because of this, the Americans offered five thousand pesos for his arrest and had the province blockaded for two years. All the efforts of the Americans did not stop Lukban from carrying the resistance, even helping the fighters in neighboring province to manufacture saltpeter. He dispatched Claro Pimentel, another fighter, to investigate the surrender of the Filipino military chief in Masbate and reorganized Leyte after its governor Ambrosio Mojica surrendered to the Americans. On August 18, 1901, American soldiers headed by Captain H.L. Jackson of the 1st US Infantry discovered Lukban's stronghold along the Catarman River. An encounter ensued which left the Filipino General, although wounded, managed to escape while his family and several fighters were captured. On September 28, 1901, American suffered the fury of the Samareños. Many natives carried a successful attack against them in Balangiga, Samar. Although there was no document pointing to Lukban's participation in the attack, it was assumed that he had a part in organizing it. In response to the grim attack in Balangiga, American soldiers under the command of General Jacob H. Smith, doubled their efforts to arrest the Filipino fighters, including Lukban, who replied that he would only surrender until the American soldiers withdraw from the Gandara Valley. On February 18, 1902, Lukban was eventually captured by the troops of American Lt. Strebler. Lukban was imprisoned in Talim Island in Laguna de Bay until July 15, 1902 after he took an oath of allegiance to the United States. In 1904, Lukban was again imprisoned but this time, with two of his brothers, Justo and Cayetano, and charges of sedition slapped on them by the Manila Secret Police. The Supreme Court, however, acquitted them for lack of evidence. With peace restored and the civil government established, Lukban engaged in business. He joined politics under the Nacionalista Party in 1912. He was elected governor of Tayabas province and was reelected for another term in 1916, which he was not able to finish because he became ill. Vicente Lukban eventually died on November 16, 1916. Agoncillo, Teodoro A. History of the Filipino People 8th Ed. Quezon City: Garotech, 1990. Quirino, Carlos. Who’s who in Philippine History. Manila: Tahanan Books, 1995.